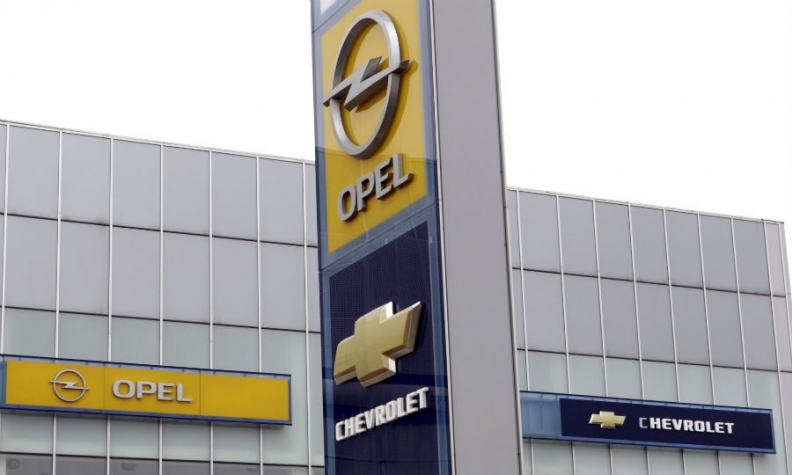 A dealership in Stavropol, Russia, displaying Opel and Chevrolet logos before GM wound down its operations in the country. General Motors can envision a day when it restarts vehicle production in Russia, its top European executive said. After sales slumped during Russia's economic crisis, GM last year stopped sales of mainstream Chevrolet models and all Opel cars in the market and mothballed its St. Petersburg factory. GM has no current plans to restart production but the company's Europe boss, Karl-Thomas Neumann, said the automaker has the "building blocks" needed if it decides to revive its Russian operations. "We still have a dealer network for Cadillac and premium Chevrolet models, so never say never," Neumann told Automotive News Europe in an interview. But GM is unlikely to relaunch its Opel brand in Russia. "I would be very surprised if the brand we come back with is Opel,” said Neumann, who is also Opel CEO. Before its closure, GM built the Opel Astra and Chevrolet Cruz compact models at the plant. GM now sells only three import cars in Russia -- the Chevrolet Tahoe, Corvette and Camaro. Two years ago Neumann succeeded in getting GM's Russian operations transferred to its European unit from the automaker's largely Asian focused international operations division. At the time it was considered a coup because Russia was forecast to overtake Germany as Europe’s largest car market. This nearly happened in 2008 and again in 2012, when vehicle sales rose to 2.93 million. Russia had been Opel’s only growth market and GM had success with its dual brand strategy in the volume car market. It sold low-cost, volume Chevrolet cars for customers cross-shopping other affordable brands such as Hyundai and Kia, while offering near-premium Opel cars that competed with European brands including Volkswagen. However, following GM's bankruptcy in 2009, Opel never fully returned to its former success in Russia, where sales reached a record high at 99,000 cars in 2008. In 2014, volumes fell 20 percent to 65,000 and the trend early last year showed sales in a free fall. Chevrolet was managing far better at 200,000 as recently as 2012, but it too saw sales drop precipitously. GM pulled both brands from Russia's volume car market came in March 2015 after the economy continued to collapse under the strain of low commodity prices, especially crude oil. At the time, new-car sales in Russia were on track to shrink by nearly 50 percent from its 2012 mark of nearly 3 million amid a plunging ruble and economic sanctions imposed after the Ukraine crisis. With the business case worsening, Neumann was unwilling to build up his fixed cost base to meet Russia’s Decree 166, which stipulates foreign carmakers operate with an annual capacity to produce 300,000 cars locally in order to avoid costly import tariffs. Most Russian plants struggle to achieve anything close to that level. AvtoVAZ CEO Bo Andersson told participants at the 2015 Automotive News Europe Congress in Birmingham, England, that most car plants are sub-scale with only three in the country producing 200,000 units or more. GM’s St. Petersburg factory only built about half that amount, Andersson said at the time. GM's U.S. rival, Ford, took a different approach to expanding in Russia, forming a joint venture with Sollers that took some of the financial burdens of expanding plant capacity off of the American carmaker's shoulders. Ford remains committed to the market, despite its 40 percent drop in volume last year to 38,600 cars, which was more than 10,000 units below Chevrolet's sales despite its departure from the mass car market. Compared with the saturated European market, where sales are primarily driven by replacement demand, Russia remains a car market with a high structural potential, thanks in part to low car ownership. Because of this, GM made an effort to part ways amicably in case market prospects become sufficiently bullish to warrant a return.